When a study found that the business school at the University of Missouri at Kansas City boasted the world’s No. 1 program in innovation-management research, officials from the chancellor on down basked publicly in the news. Now an investigation by The Kansas City Star has cast substantial doubt on that glowing result. The two authors of the 2011 paper, who were visiting scholars at the school when they did the study, apparently structured it to ensure the top ranking, the newspaper reports. Administrators at the school were aware of the reshaping of the data, the Star adds. “I just think this paper is fatally flawed,” said Ivan Oransky, of the blog Retraction Watch. A likely motive for the effort, the newspaper says, was to meet the expectations of Henry W. Bloch, the benefactor for whom the school is named. The university told the Star that it stands by the study. In my own rankings (nicknamed the "JW Economist Ranking System") would make sure I was counting total papers (not citations and not adjusted for the number of co-authors) in mid-level journals. Boast that you are in the top ten! In the world! Gov. Rick Perry of Texas and Senator James M. Inhofe of Oklahoma are among the most vocal Republican skeptics of the science that burning fossil fuels contributes to global warming, but a new study to be released Thursday found that their states would be among the biggest economic winners under a regulation proposed by President Obama to fight climate change. The study, conducted by the Center for Strategic and International Studies and the Rhodium Group, both research organizations, concluded that the regulation would cut demand for electricity from coal — the nation’s largest source of carbon pollution — but create robust new demand for natural gas, which has just half the carbon footprint of coal. It found that the demand for natural gas would, in turn, drive job creation, corporate revenue and government royalties in states that produce it, which, in addition to Oklahoma and Texas, include Arkansas and Louisiana. The study took into account the economic costs imposed by the regulation and concluded that it would raise electricity rates by up to 10 percent in some parts of the country and eventually freeze coal production. But even taking those costs into account, Arkansas, Louisiana, Oklahoma and Texas together would experience an annual net economic benefit of up to about $16 billion, according to the study. “The irony is that some of the states that have been the loudest in opposing E.P.A. climate regulations have the most to gain in terms of actual economic interest,” said Trevor Houser, an analyst at the Rhodium Group and a co-author of the study. A new article in Nature: Climate Change says that the recent 15 year non-warming period is fully explained by climate models that account for El Nino and La Nina. "Washington College Students Rally to Protect Cows From Global Warming"
A newly released report showing that higher temperatures cause cows to give less milk is uniting climate and animal rights activists to take immediate action to counteract the negative effects of bovine heat stress. “Cows are happy in parts of Northern California and not in Florida. That’s a good way to sum up the findings of my new research,” said University of Washington economist Rainbow Moonglow Rabinowitz. “A hot cow is a cranky cow, and a cranky cow gives less milk. So, in addition to fighting climate change, we must all struggle together to make our Bovine-American friends happier. If we fail, we risk facing a tragic “Cows With Guns” scenario. Professional animal rights activist Sunshine Daffodil Wyzowski explained how she developed her so-far resoundingly successful methods of cow-cheering. Local dairy-owner Billy Bob Jones, whose farm was the center of a recent cow-cheering event, reported mixed results. The Tour de France can be unforgiving and crushingly heartbreaking. On Sunday's stage 15, Jack Bauer experienced this firsthand. Does Jack infiltrate the U.S. Postal team to stop a redeveloping EPO ring? Does Lance Armstrong make a guest appearance as the evil ringleader? "You show me a polluter, I'll show you a subsidy; I'll show you a fat cat who's using political clout to escape the discipline of the free market and force the public to pay his production costs. That's what all pollution is -- it is always a subsidy." ~ Robert F. Kennedy Jr.
Now, federal officials are weighing putting [the sage grouse] on the endangered species list — setting off a mad scramble among the unlikeliest of allies to save the bird and avoid disrupting the nation’s enormous growth in energy production. With a range stretching over more than 165 million resource-rich acres across 11 states, the grouse is at the center of one of the country’s most important struggles: to balance the demand for energy against the needs of nature. And in the process, it has put two environmental priorities — preserving species and fostering renewable energy — on a collision course. That prospect has prompted an unusual collaboration among state and industry leaders to show federal wildlife officials, who have until September 2015 to decide on the endangered designation, how the bird can coexist with economic development. And federal officials, frequently at odds with one another over such matters in the past, are in on the act, overseeing an enormous effort among all the affected states to pre-empt the designation. Remember preemptive harvesting? If you were suspicious that you might have a red-cockaded woodpecker on your land then you would go ahead and cut down your longleaf pine trees ahead of the optimal rotation.The difference here is that the natural resource is underground and you can't destroy the habitat (well, you can but the birds are already there) before the species is put on the endangered list. 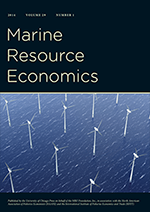 "A revealed preference approach to valuing non-market recreational fishing losses from the Deepwater Horizon oil spill"
In West Virginia’s Appalachian mountains, fish are vanishing. The number of species has fallen, the populations of those that remain are down, and some individual fish look a little skinny. The coal the process produces provides power to hundreds of thousands of homes, industry advocates say, and creates about 14,000 jobs that pay middle-income salaries in regions where work is hard to find. Raney’s association disputed claims that mining destroys streams and mountains, saying state permits and government regulations require the land to be restored after use. This is a situation where the lack of valuation for water quality and fish makes consideration of what is best for society very difficult. Armed with market transactions (and their permits that insure pristine environmental quality after reclamation) the coal industry presents the costs of regulations in dollar terms while the scientists present the benefits in species and stock status terms. That isn't a fair fight. This is an example of why environmentalists and efficiency advocates should think that environmental valuation is needed. Getting ahead of that curve, industry argues that environmental valuation is junk science. When environmental regulation costs are monetized and the benefits are not, the costs will usually win. Since sometimes the benefits of regulation will exceed the costs there will be too little regulation and economic efficiency will be lower than it could be. Full disclosure: I've boarded with Doug Chambers, older brother of graduate school office mate Paul, after my car broke down in WVa.